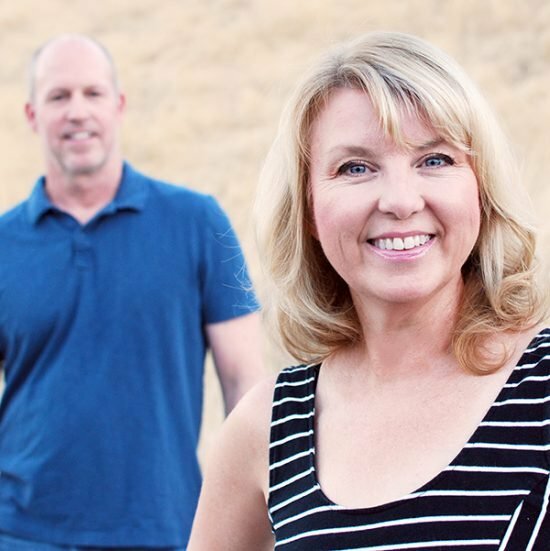 Repurposing is a craze that is not going away any time soon, and it shouldn’t! 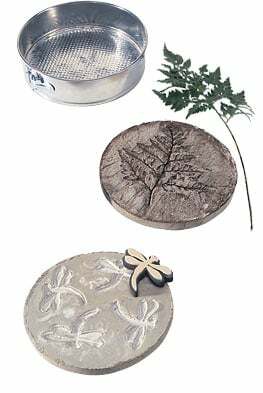 We all need to think about things in a new way to prevent waste, and it helps that it is a lot of fun to use your creativity to make old things into new. 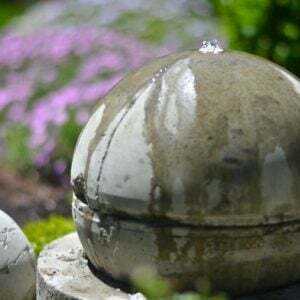 I especially love to recycle old things in the garden… Ok, it sounds dumb, but I feel like Mother Nature appreciates it just a little more when it’s used to enhance the great outdoors. Corny, yes. But hey, it makes me feel good. These thrift store DIY garden projects are just the thing for a rainy Saturday (or a sunny Monday!) 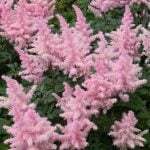 to help you decorate your outdoor space. 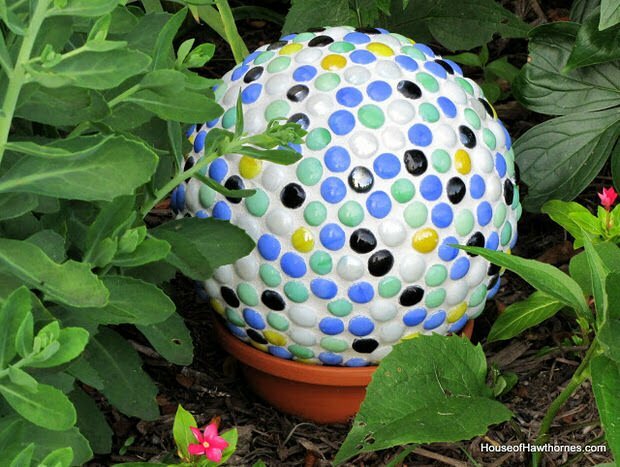 Pam at ‘House of Hawthornes‘ made this DIY mosaic bowling ball yard art from… well, yes, a bowling ball. This is an easy project with some caulk, grout and some craft store gems. 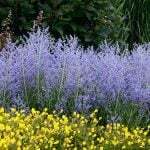 I would love one that was all aqua blue! Easy to follow tutorial with photos. Ingenious much? 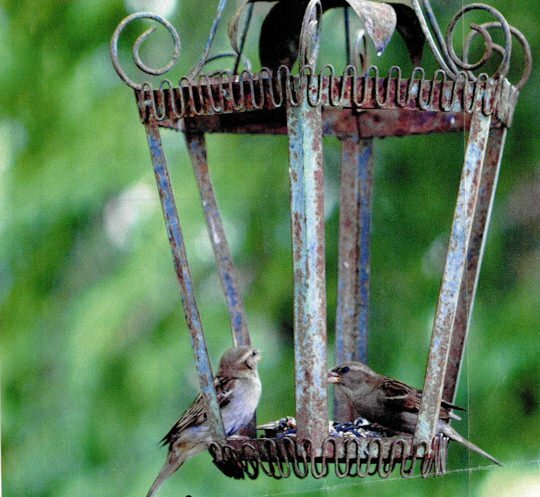 ‘Gadget Sponge‘ created these repurposed up cycled bird feeder for ‘Birds and Blooms Magazine‘! Pretty…Cool… And a good tutorial too! 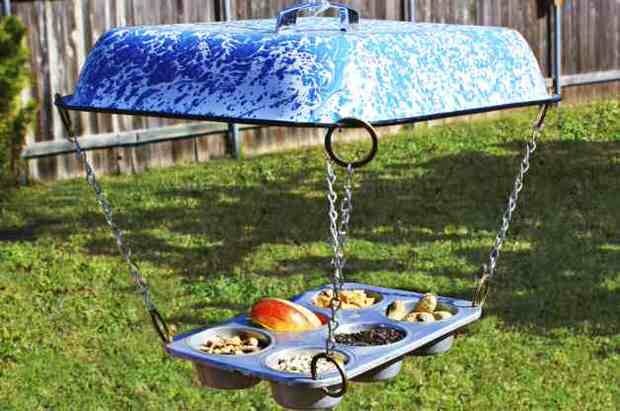 Another repurposed bird feeder that requires almost no work? 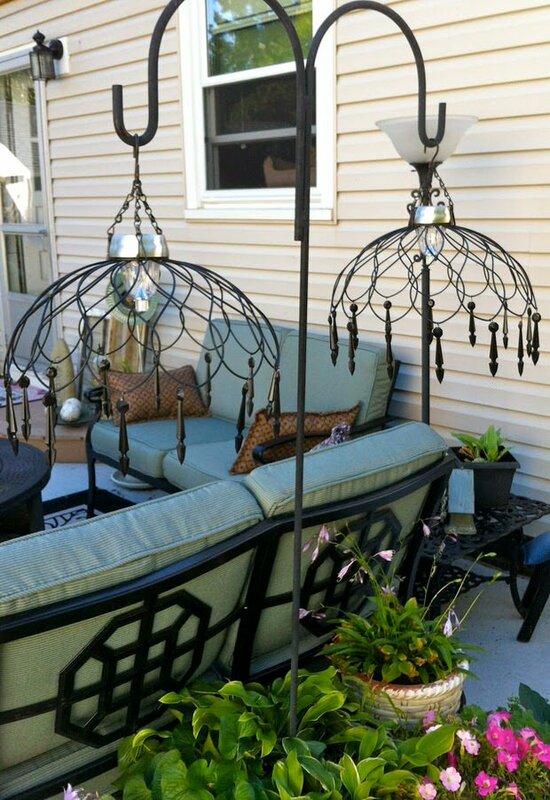 An old outdoor lantern with the glass removed… Perfect! If you find those cheap brass kinds, use a spray paint with an antique or hammered metal finish on the outside. 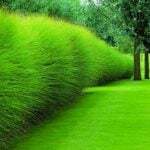 From ‘Real Simple’. Our next thrift store DIY is from ‘Ruff by Margo‘. 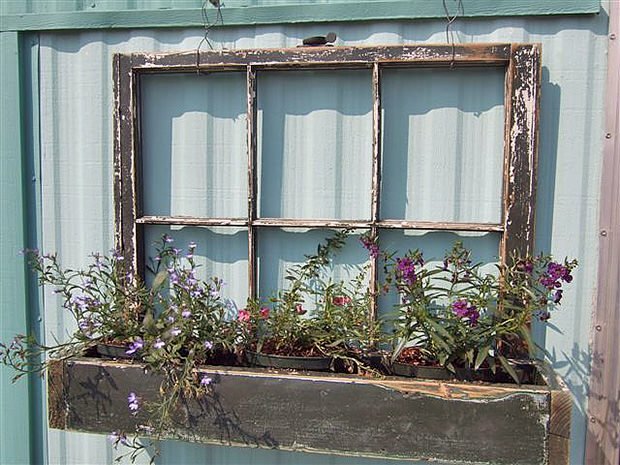 She gathers great ideas for old windows, and her reader Jennifer sent this one in, with a window box attached. So charming! Ok, this one is a cuuuttteeee. 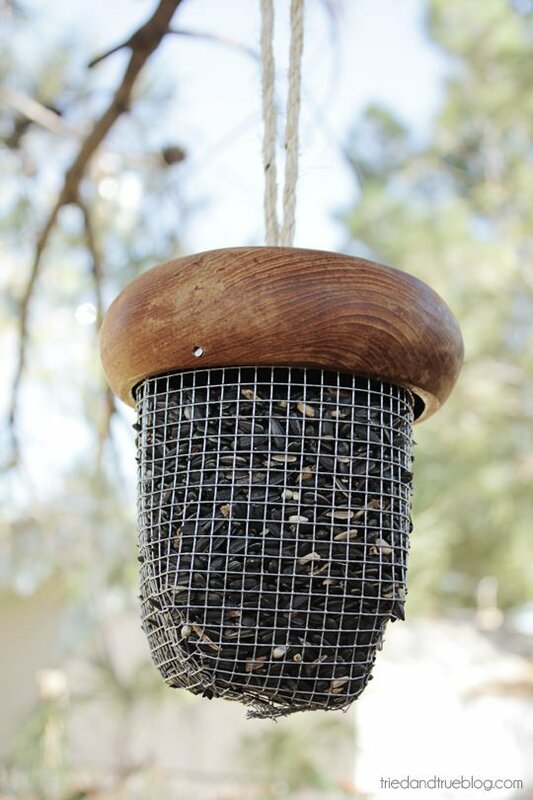 Vanessa at ‘Tried and True‘ has a full tutorial for you to learn to make her DIY acorn bird feeder. A wooden bowl from the thrift store and some wire mesh make this adorable! Let’s just hope the squirrels don’t catch sight! 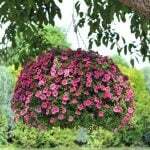 From ‘Ann’s Garden Path‘, these hanging chandeliers from wire baskets are really clever, and easy and inexpensive to make. The wire baskets are from thrift stores, and they are lit with a $1.50 Target solar light. Hang them on Shepard hooks, or I love the idea of hanging them in a tree with a little table and two chairs just underneath. 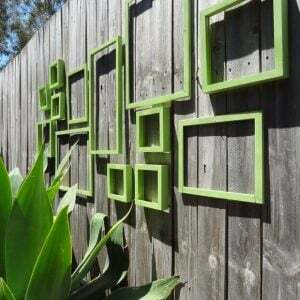 Quaint DIY garden project, huh? ‘Let’s Go Fly a Kite‘ turned ordinary thrift store salad bowls into the most adorable garden toadstools I ever saw. 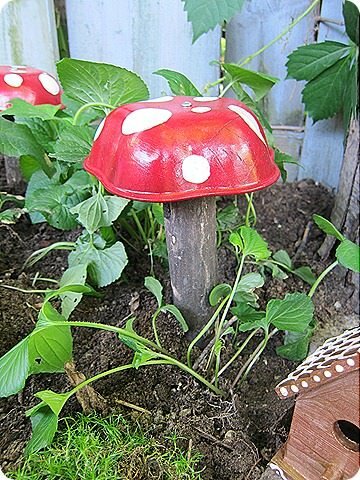 If you have kids and want to teach them the magic of nature, this is the DIY garden project for you. (Or, even if you don’t!) Step by step photos. Love this! 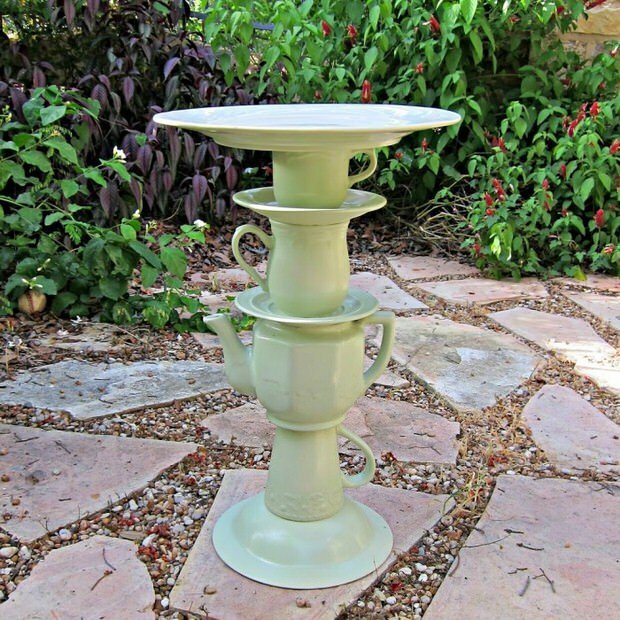 From ‘Morena’s Corner‘, this DIY tea pot bird bath is really a piece of vintage art. I love how she reminds us not to paint the top, inside portion of the bird bath. It can’t be good for them! And I really like the soothing green she chose… just enough of a color pop that this thrift store DIY garden project stands out in the garden, but not so much as to clash with it’s surroundings. Use a thrift store spring form pan to make these DIY stepping stones from ‘Home Hardware‘. Very simple DIY garden project tutorial. Either a project with the kids this weekend, or for yourself! 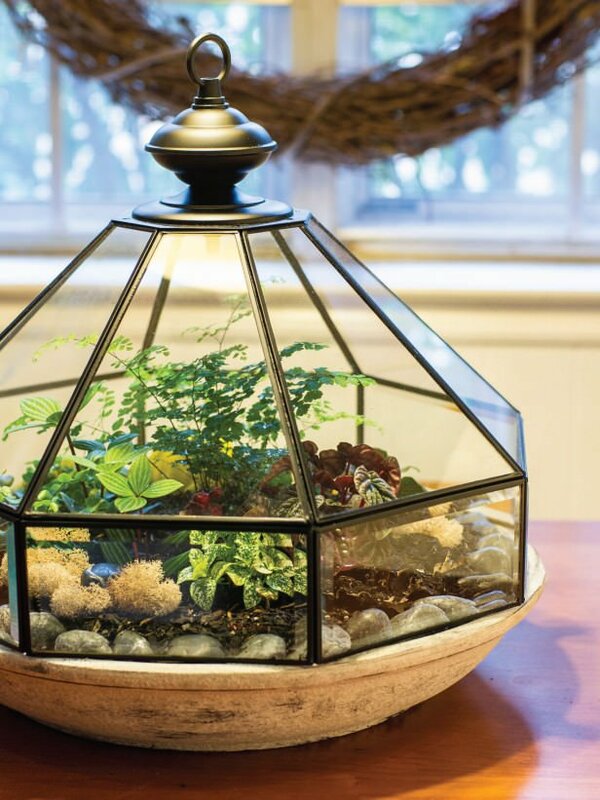 Make a terrarium from a repurposed light fixture with this idea from ‘HGTV Gardens‘. Easy! Oh, and they have full instructions on caring for a terrarium too! 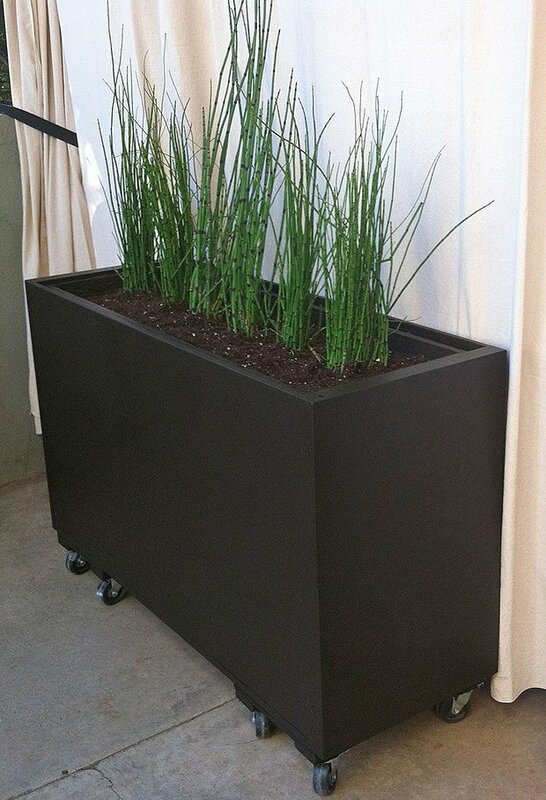 This dresser turned planter from Kay Basset is via ‘Flea Market Gardening‘. 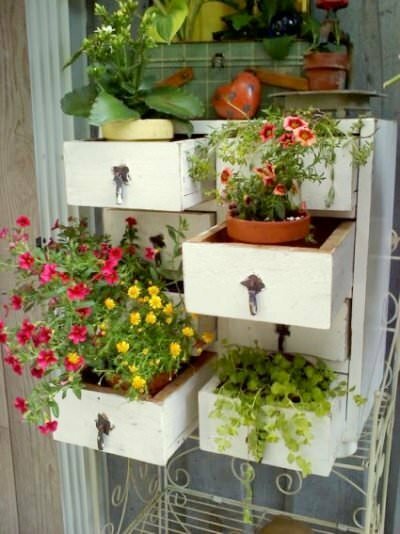 Great site with a lot of DIY garden thrifting ideas! Finally, this last one from ‘Lily Pad Cottage‘ I’m throwing in there for two reasons. 1. 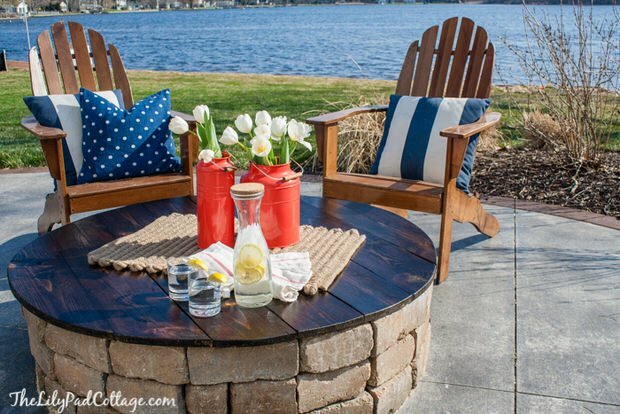 Even thought she made this amazingly smart DIY fire pit table top from scratch, this could be made using the top of a thrift store dining table as well. 2. It’s smart! If you enjoyed our post on Thrift Store DIY Garden Projects, then we think you will also love DIY Teacup Gardens and Planters and How to Make a Unique Garden Lantern! And don’t forget to pin for later!